President Obama speaking with astronauts on the International Space Station March 24, 2009. From left: Sen. Kay Bailey Hutchison (TX); John Holdren, Director of the Office of Science and Technology Policy; Sen. Bill Nelson (FL), right, who flew aboard the space shuttle in 1986. This morning John Holdren, PhD, Assistant to the President for Science and Technology and Director of the Office of Science and Technology Policy, spoke at the AAAS Forum on Science and Technology Policy. Most of what Dr. Holdren presented this morning reinforced what President Obama recently said in his address at the National Academy of Sciences. Dr. Holdren concluded his remarks by telling the audience that our greatest asset right now is the President's engagement with science and technology. It is refreshing to have an Administration who is on the side of science, but this does not mean that we can be complacent. Congressman Bart Gordon, Chair of the House Committee on Science and Technology, also spoke at the Forum this morning, and called on the science community to demonstrate the results of science. He said it is essential to "put a face on science" and to help the public understand that science is about jobs and quality of life because there are many competeting programs and a limited budget. While the American Recovery and Reinvestment Act and FY 2009 appropriations have provided an infusion of funding for research and development, more work is ahead to ensure that research is a funding priority in the years ahead. Stan Collender of Qorvis Communications and a U.S. budget expert told the Forum audience that starting in 2011 there will likely be ambitious budget deficit reduction efforts, some of which will come from cuts in discretionary spending. This means that in order to pay for research, other programs would have to be cut. Collender said that it will be critical for scientists to talk to the public and Congress about why research is important to the U.S. So, although science and technology has this tremendous asset in the White House, the overaraching message that I heard this morning is that scientists need to speak out now to ensure research continues to be a priority. After a long time working in labs, I am now in a workplace dominated by non-scientists. This has led to some very interesting discussions about what kind of people practice science. "I would have never thought you are a scientist- you are so fun." "You are so not a geek, are you sure you are a scientist?" This got me thinking- what characteristics do people associate with the word scientist? I did some research and found some great articles talking about the image of scientist in the zeitgeist. In a great piece Marcel C. LaFollette summarizes the work of many authors tracking the changing image of scientists. Early in the 20th century scientists tended to be portrayed as slightly eccentric heroes who burned the midnight oil and saved the world by their amazing discoveries. This average Dr. Joe was white and male [surprise :( ]. By mid-century, the age of "Big Science" had begun. People were awed and terrified by the power of science and consequently scientists began to be portrayed as Dr. Jekyll and Mr. Hyde. More Dr. Jekyll - thankfully - than Mr. Hyde. But they were still male and white. Most adults think of Einstein when asked to name a scientist and his most famous images, of course show him with his frizzy, disheveled hair, rumpled clothing and an absent-minded, wistful expression on his face. Studies that have looked at how scientists are portrayed in today's popular media have concluded that the image is largely positive. Scientists are mostly shown as people who work for the betterment of mankind and are people worthy of trust and respect. Most people also respect science as a profession and think scientists are the best spokespersons when it comes to explaining research findings (check out slides 16,17 and 18 from the poll). If this true, I wonder why more scientists are not using this image to their advantage and advocating for science? or even speaking out more on issues that directly impact science and society? Here at New Voices we like to stay on top of the new things going on in the world. In the process, we realized we haven't been able to go anywhere without hearing about people tweeting. So we sought out a friend of New Voices, Allison Bland, to tell us about the (not so) new social media tool Twitter. By now, you’ve probably heard of Twitter. You may have even tried it out. How do you use this thing? What is Twitter all about? I manage the Twitter account for Research!America, and while it continues to be a learning process for me, I think it’s a helpful advocacy tool and an exciting new way to communicate. In 140 characters or less, Twitter users broadcast messages to “followers” who read a stream of tweets from users they have chosen to follow. Users can respond to each other by adding the @ symbol before another username or respond to threads of conversations by adding # in front of an agreed upon tag for the topic (#science and #health are some of my favorites). I’ve been happy to discover a lively group of Twitterers who frequently tweet about the evolution of science communication. You might be interested in following @BoraZ, @nancyshute, @girlscientist, and @Bridge2Science. Share. Twitter is a great way to get a message out to a receptive audience, but you add value to your tweets by helping others and providing useful information: alert your followers to new Twitter users they might be interested in, link to original content, and retweet relevant tweets. Talk to the right people. Finding the right audience for your tweets can be one of the biggest challenges. How do you know if your followers are really listening? I use bit.ly, which is primarily a URL-shortening application, but it has a lot of other neat features. Your bit.ly account will show how many people clicked through the links in your tweets and who retweeted the same link. Using bit.ly, I’ve found that global health-related links are especially popular with our followers. Listen. I imagine Twitter as a huge room of people having a conversation. Tune in and tap into what people are saying to stay connected. A quick scan through the latest tweets will give you a sense of the most current topics, whether it’s a major conference or Ashton Kutcher and malaria nets. Stay active. Twitter is habit-forming, so this shouldn’t be a problem, but make it a point to be an engaged user. Tweet every day, follow people who have followed you back, and participate in conversations. Soon your network will grow and you will be part of the Twitterverse! Allison Bland is a communications intern at Research!America and a recent graduate of McGill University with degrees in English and history of science. This is Part 3 in the New Voices series on helpful technology for science communicators and advocates. 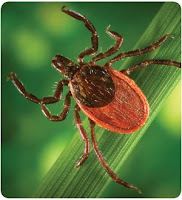 In a continuation of our Climate Change and Health series, today's post is about Lyme disease. Like malaria, Lyme disease is also likely to spread due to climate change. While malaria largely affects countries overseas, Lyme disease is the most common vector-borne disease in the U.S. with more than 21,000 cases reported each year. Typical symptoms for Lyme disease include fever, headache, fatigue, and a skin rash. If it is untreated, the infection can spread to joints, the heart, and the nervous system. Predicted milder winters will increase the survival of disease-carrying deer ticks, which can then infect humans. A recent study by researchers at Yale has shown that the severity of Lyme disease may increase as tick's seasonal feeding cycles changes due to climate. Currently, Lyme disease is most prevalent in the Northeast, as illustrated by the map below. This is Part 4 of 7 in our Climate Change and Health series. Yesterday's post about the potential impact of climate change on malaria incidence details why paying attention to the disease is so important. We’ve made significant advances in malaria control with the money invested so far, but more research for malaria still needs to be done. In honor of World Malaria Day, we've complied a short list of resources, interesting projects, and some great people working in the field. The CDC and NIH both provide extensive information regarding malaria. UNICEF provides this fact sheet and the Global Malaria Action Plan is particularly interesting for more in depth information. Artemisinin Project — is a collaboration between the Gates Foundation, Sanofi Aventis, Amyris Biotechnologies, a researcher at University of California, & the first nonprofit drug developer in the U.S.—to develop lower cost, semi-synthetic artimisinin. GlaxoSmithKline's Patent Pool — Glaxo recently donated 800 of its patents related to neglected tropical diseases to a patent pool. These diseases are considered largely unprofitable ventures, since they mostly affect people in poor countries. Glaxo is trying to encourage global collaboration for research to find better treatments. We know a lot of you out there are jealous of Luke's lightsaber. Well soon, you can have your own mosquito zapping laser gun! Ambassador Barry Beaty runs a program called Casa Segura (Safe House), which uses interventions-such as insecticide treated bed nets- to prevent vector transmission in homes. Ambassador Jim Kazura has been studying malaria in children, and those that acquire immunity to the disease, to learn more about the relationship between their responses to the disease and their immunity. Ambassador Frank Collins has been helping to sequence or map the Anopheles gambiae, the mosquito that is the primary transmitter of malaria parasites in sub-Saharan Africa. Last week, Ashton Kutcher and CNN got in a race to see who get get the most "followers" on Twitter... with a goal of reaching 1 million. Ashton won, and is donating $100,000 (10,000 bednets) to fight malaria in Africa, using Twitter as a social tool to raise awareness for World Malaria Day. Tomorrow is World Malaria Day, which fits right in with the theme of my climate change and health project, since I used malaria as an example of how vector-borne diseases may spread. Vector-borne diseases are infections that are transmitted to humans and other animals by blood-feeding insects, such as mosquitoes, ticks, and fleas (hence, vector=bug). Malaria is the most deadly global vector-borne disease. It is a blood infection that is transmitted by female Anopheles mosquitoes. The mosquito transmits a parasite that infects the liver and spreads to red blood cells. Currently, 41% of the world's population live in areas where malaria is transmitted. Each year 350–500 million cases of malaria occur worldwide, and 1-3 million people die, 80% of them in sub-Saharan Africa. The majority of malaria infections in the U.S. occur among travelers that bring the infection back from another country. The CDC reported 1,564 cases of malaria in the US in 2006. In many temperate areas, such as Western Europe and the US, economic development and public health measures have eliminated malaria. However, most of these areas have mosquitoes that can transmit malaria, and reintroduction of the disease is a risk. Climate change and its effect on the spread of vector borne diseases is challenging to model. However, significant relationships have been documented between the El Niño Southern Oscillation and epidemic malaria in Asia and South America. El Niño is a cyclical weather event that lasts from 1.5-2 years and builds up warm surface water off the coast of South America, increasing air temperature and the chances of rain and floods. El Niño could be an indicator for the effect of climate change on malaria incidence. The annual total number of malaria cases is strongly correlated with sea surface temperature changes in the eastern equatorial Pacific. One study showed that in Colombia, malaria cases increased 17.3% during a Niño year and by 35.1% in the post-Niño year. Though these changes are more sudden than what we can expect to occur from climate change, the health impact could still be severe. Geographic distribution of malaria and the number of cases are expected to change as climate changes, like during El Niño years. This map presents a possible scenario for malaria in 2050 and shows regions that have endemic malaria now and regions where it may spread. In some areas where climate could decrease rainfall, the number of mosquitoes may decrease and so would malaria transmission rates. Changes in malaria distribution on a global scale is still an area of active research. Despite the strong connection between malaria and climate, there is still uncertainty about future malaria transmission rates because there are many other factors that affect the disease’s spread, such as socioeconomic development, drug resistance, and immunity. Tune in tomorrow for a special Saturday post for World Malaria Day. This is Part 3 of 7 in our Climate Change and Health series. 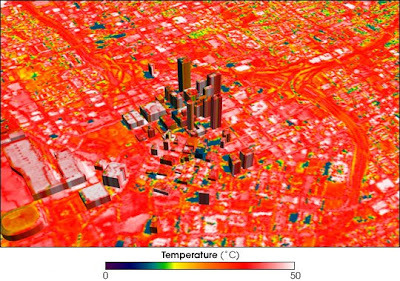 A thermal image of Atlanta, GA in May 1997. Daytime temperatures averaged 80°F (26.7°C) but some surface temperatures reached 118°F (47.8°C). Climate change is going to have various impacts on health and society. Since the Administration is open to addressing it, advocacy messages surrounding the health implications of climate change will be important. President Obama has prioritized energy, health care, and education as three areas that are critical to our economic future. Climate change and health are the intersection of these priorities and awareness about the possible health impact of climate change is crucial so that we can promote research and action to lessen these effects. Heat related illnesses and death are expected to increase due to climate change, mostly caused by cardiovascular and respiratory issues associated with higher temperatures. Heat is the leading cause of weather-related deaths in the U.S., and was responsible for more than 3,400 deaths between 1999 and 2003. According to the CDC, heat waves already cause more deaths per year than hurricanes, tornadoes, floods, and earthquakes combined. They are likely to increase in intensity and frequency as temperatures rise over the coming decades. The urban heat island effect traps heat in concrete and asphalt, which can cause temperatures in urban areas to range up to 22°F (12°C) warmer than the surrounding countryside. Some researchers have predicted there could be a 47-95% increase in heat-related premature deaths due to climate change in the New York City region. When I was working at a planning commission in New Hampshire, I learned that chemicals like carbon monoxide, ozone, and particulate matter are measured, and state environmental departments will issue air quality alerts, typically in the summer when heat and weather intensify the problem. Excessive heat will contribute to an increase in air quality alerts, limiting outdoor activities. In general, healthy people will have an increased risk of developing respiratory issues like asthma and allergies. This is Part 2 of 7 in our Climate Change and Health series. Happy Earth Day! For the past few months, I have been researching the health impacts of climate change as part of my internship. This is an incredibly broad topic, and it was challenging to narrow it down to a focus area for a 20 minute presentation to my coworkers. So in honor of Earth Day, and to celebrate the completion of my project, we're posting about climate change and health. Climate change has been well documented and is widely agreed upon by most scientists, though it can still be politically divisive. In 2007, the Intergovernmental Panel on Climate Change (IPCC), the premier working group on climate change that is overseen by the UN, released a report that compiled the best scientific projections about climate change up until that point. The report stated that 11 of the 12 years from 1995-2006 rank among the warmest years since we began recording global surface temperature in 1850. Temperature fluctuations are part of climate’s natural variability, but there has been a general warming trend over the past century. IPCC projections suggested that global average air temperature could rise from between 2-11.5 degrees F and sea level could rise between 7 inches and 2 feet by 2100. However, scientists are now warning that there has been a noticeable speed-up in the causes and symptoms of climate change. For example, newer local projections suggest that in New York, mean annual temperatures may increase by up to 3 degrees and average sea levels could rise by 2 to 5 inches by the 2020s. By the 2080s, temperatures could increase by up to 7 ½ degrees, and sea levels could rise 12 to 23 inches, a much higher rate of change than the IPCC predicted. Climate change is already affecting health, and will continue to do so as it progresses. The EPA recently announced that greenhouse gases, which are a major contributor to climate change, are hazardous to human health. 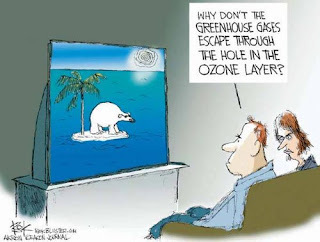 The good news is, this opens the door for regulations of greenhouse gases, so hopefully we don't wind up in this scenario, with temperatures in parts of the world increasing as much as 8 degrees Celsius, or almost 15 degrees Fahrenheit. Imagine the difference between a 75 degree and 90 degree day... for extended periods of time. Obviously, those sorts of climate changes are going to have noticeable implications for human health. Over the next few days, we'll be looking at a number of the ways that climate change could alter human health. This is Part 1 of 7 in our Climate Change and Health series. Tomorrow is Earth Day and here at New Voices we have some interesting posts planned in celebration. We'd also recommend following along with other science bloggers talking about Earth Day including Sciencewoman's post on cost saving green options for universities (or organizations). But, as it is a day in celebration of our wonderful planet, we hope you'll be getting out to observe the occasion and we want to show you where the fun stuff is happening! Don't worry if you have to work tomorrow (hey, we do too! ), there are lots of great events planned for the weekend as well. The largest databank of Earth Day events can be found at EPA's Earth Day website. In San Francisco, the California Academy of Sciences has a line-up for both education and outdoor exploring in Golden Gate Park. From film screenings to green career fairs, Connecticut is in full Earth Day mode. Lincoln Park Zoo is celebrating science tomorrow, while the Chicago Park District has events throughout the week, and Loyola has a north lake shore program on Saturday. The University of Maryland (College Park) will have environmentally-themed lectures and musical performances Wednesday and Thursday. Honestly, we didn't go through it all, but check out this PDF for lots of events going on all over Massachusetts. Head to Grand Central Station for Earthfair if you're in the NYC area and Stony Brook locals can be part of Earthstock. The Astros are playing green in Houston and Galveston is combining Earth Day with the Oleander Festival. Alexandria is holding a festival, including selling composting bins for those who want to be Earth friendly all year long (and create their own fertilizer!). Representing the 5th district of Alabama (The Fightin' Fifth - for Colbert Report fans) is Parker Griffith, MD. Dr. Griffith is a retired physician having practiced radiation oncology for several years in northern Alabama. As a member of the Science and Technology committee, Congressman Griffith is involved in shaping issues directly related to NASA as well as the National Science Foundation. NASA's Marshall Space Flight center is in Alabama's 5th district as are other hi-tech operations and Rep. Griffith is working to ensure that they perform at their full potential. He believes we must aggressively pursue avenues to promote scientific and technological advances. Recently, he toured the Floyd Science building at the University of North Alabama. The 50 year old facility is in dire need of improvements. Rep. Griffith has made it one of his top priorities to secure funding to replace the aging science center. The committee on science and technology is working with the Obama administration to implement the Advanced Research Projects Agency for Energy (ARPA-E). ARPA-E is tasked with undertaking high-risk, high-reward projects especially multi-disciplinary projects bringing together both public sector and private entities to solve the energy problems of the country. For our readers in Alabama’s fightin’ fifth, contact Rep. Griffith and thank him for his support of science and technology initiatives. As advocates, reach out to your legislator and find out where they stand on issues that are important to you. If you’re interested in seeing your legislator profiled here on New Voices, let us know in the comments section! Can't get enough advocacy? Neither can we. Here's our hot sheet on upcoming science education, advocacy events and opportunities. And, as a thank-you to our regular readers, we've highlighted events in some of our top readership cities! Want to keep learning but a bit short on tuition? There are lots of places to take the same classes as students at Harvard, MIT, the London School of Economics, Berkeley, Yale, and the Johns Hopkins Bloomberg School of Public Health (among many others). And for the astronomically inclined, check out these 50 open course opportunities. Support biomedical research next Wednesday, April 22 at this Pro-Test in support of local animal researchers. There's a lot going on in the Twin Cities for Earth Day this weekend. Tonight at 6pm at the New York Academy of Sciences there's a lecture on agriculture in urban centers. It's also available online for those outside the area (or stuck in Friday night traffic!). And this weekend, venture out to Bodies, The Exhibition. Head to the Mall this weekend (April 18-20) to see the National Sustainable Design Expo. It's a great event with some very cool homes. We'll have lots more local opportunities as well as a series on the health implications of climate change in celebration of Earth Day next week. Have a great weekend and don't forget to get out and advocate! 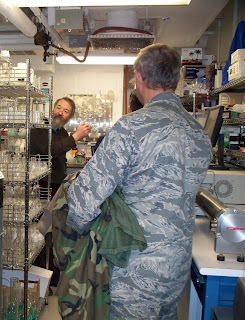 Dr. Philips showing the guests his lab. Last month I went on a tour of the National Institute of Biomedical Imaging and Bioengineering (NIBIB), sponsored by the Coalition for Imaging and Bioengineering Research. The purpose of the visit was to inform people about the innovative research that is happening at NIBIB so that they can better advocate to Congress. The back of my head! And Dr. Philips showing us how lab technicians analyze blood samples. The morning began with a presentation by the Director of the NIBIB, Roderic Pettigrew, PhD, MD. Dr. Pettigrew presented an introduction and overview of current projects. My favorite was the “Brain-Computer Interface.” This innovative technology allows people with paralyzed limbs to type on a computer by having the computer read their brain waves while they think of letters, which it will then type. It was recently featured on a 60 Minutes special called “Brain Power.” You can view the clip here. The next presentation was by Dr. Bradford Wood, who specializes in interventional radiology research. He explained image guided therapy, one of the most recent surgical techniques being applied at the Clinical Center. This technique allows doctors to use imaging during surgery for more minimally invasive, safer and cost effective procedures that produce better outcomes. One example is using imaging to view a tumor during surgery so that the surgeon can see and remove the entire tumor rather than guessing if the general area around the tumor needs to be removed and then finding out after surgery that he/she missed a spot. At this point, I was wondering how I could ever settle for treatment with “normal” technology after learning about all these innovations! 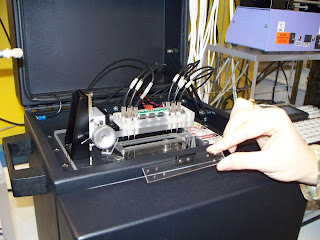 A lab technician analyzing samples in the Nanoscale Immunodiagnostics Laboratory. The visit concluded with a tour of the Nanoscale Immunodiagnostics Laboratory by Dr. Terry Philips. The lab does extremely small scale blood sampling (for example, taking a tiny amount of blood from premature babies) to diagnose immunodeficiences. 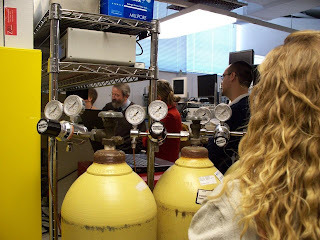 It was my first time in a lab at NIH and I appreciated Dr. Philips' enthusiasm as he showed us around his domain. At one point, he was passing around microchips (little glass slides that hold blood samples for analysis) and he said, “If you’re going to drop one of these chips, it should be this one, it’s only $600.” Eek! As a science policy intern coming from a non-science background, seeing the work that is going on at NIH first-hand really helps me understand why advocating for science is so important. If you ever have an opportunity, go on a tour of a local lab or research center to learn about the unique research that is going on in your own community! Since the first family just got a new dog, we thought it would be interesting to share some information about dogs, how different breeds evolve, and how man’s best friend has more in common with us than we might suspect. Today’s guest bloggers – and genetics experts - Tyrone Spady and Pascale Quignon are postdoctoral fellows at the National Institutes of Health. The domestic dog (read: friendly, furry pet) arguably shows more variation than any other species of land animal. From the smallest Chihuahua to the tallest Great Dane, and from the long-haired Afghan hound to the short-haired boxer, all are members of the species Canis familiaris. Their tails can be curly, straight, or even kinked. Their ears can be long and droopy, short and up-right, or anywhere in between. And with 224 dog breeds recognized by the American Kennel Club (AKC), choosing the breed of the First dog was bound to be difficult process for the Obamas, who like many families across the United States, were confronted with the seemingly endless variety dogs. Although the extreme diversity of dogs may make it difficult for indecisive would-be dog owners*, from a scientific perspective it creates an incredible opportunity to understand the genetic basis of morphology (size and shape), behavior, and disease susceptibility. 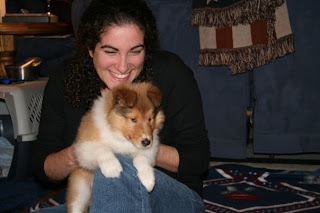 New Voices blogger Heather with the family Collie puppy, Baggins, in Dec. 2008. Dogs were developed to herd, guard, track, point, chase, flush, retrieve, pull and, of course, cuddle. By the mid 19th century, dog fanciers had formalized the “breed” concept and developed written breed standards of appearance and sometimes behavior. To be a member of a breed according to the AKC, both a dog’s parents must be registered members of the breed. When mated, members of a breed must reliably pass on uniform, breed-defining characters. To create new breeds, dogs of different varieties may be crossed or members of an existing breed may be subdivided based on key defining characters, such as size. Breeds therefore represent closed, genetically similar populations of animals that are alike in appearance and behavior. Because breeds have a genetic base, scientists can look at traits and try to identify the specific genes that make poodles different from St. Bernards. Scientists studying the Portuguese water dog (the breed the Obama’s chose) have identified a gene that helps make small dogs small. 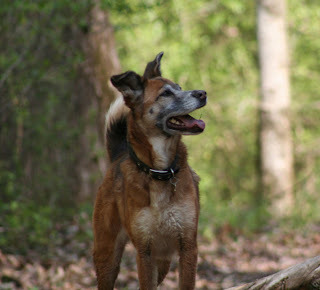 Friend of New Voices Kate, a Basenji shepherd, on a trail in Alabama last week. As man’s best friend, dogs share our environment and many diseases that affect us, including cancers, cataracts, and neurological disorders. Since dogs and humans share most of the same genes, understanding more about how dog genes control growth and development will enhance our understanding of basic human biology. A shining example of how discoveries in the dog reveal new targets for human therapies is illustrated by studies of narcolepsy in the Doberman pinscher. Studies on Dobermans revealed a biochemical pathway involved in both dog and most human narcolepsy. As a result, several new treatments are being developed. Identifying the function of genes in the dog, therefore, represents an invaluable opportunity to develop knowledge that could lead to improved treatments of human illness. Tyrone Spady, PhD and Pascale Quignon, PhD are both postdoctoral fellows in the Cancer Genetic branch of the National Human Genome Research Institute at the NIH. We know that’s just an overview of dog genetics and the basics of breeds, so if you have other questions, feel free to post them up. We’ll be working with our expert guest bloggers and will do a follow up post to answer any questions you might have. Also, you may have noticed the fun photos of the New Voices dogs throughout the post. Share your photos with us (please include the name of your adorable pooch and breed if known) and we’ll post them along with the answers to readers questions! *If you’re looking for a furry friend to add to your family, there are a number of great adoption agencies across the U.S. that will help match your needs and desires with the perfect pet. For more information on matching, check out the Washington Area Rescue League's Meet Your Match. In the newspaper industry they say that old news is not news. I think when it comes to timely publications, that may be true. But for the past couple of weeks I've been intermittently reading a July 1945 report to the President from the director of the Office of Scientific Research and Development that may actually still be news. As our country transitions into restoring science as a foundation for policy, we'll refer back to interesting pieces from the report. It's definitely on our recommended reading list. This is Part 1 in our ongoing discussion of Science the Endless Frontier. Here at New Voices, we like to give you profiles of advocates who are already working to make research and science higher national priorities. As a "New Voice" you are also an advocate, so what about you? We're constantly working to do everything we can to help in your quest to become a stronger advocate for research but to do that effectively, we have to know who you are and what you like! But that doesn't really tell us about YOU. So, to help us practice what we preach (know your audience!) we'd love to hear from you in the comments section. Who you are, what you do, and what you'd like to see us cover more. Here at New Voices, we try to stay up to date on what's going on in the rest of the blogosphere (it's actually part of our job and not a procrastination technique! ), so for today's round-up we pulled together some of the posts we found interesting this week. Near the top of the list is the debut of an excellent carnival hosted by GrrlScientist, Scientia Pro Publica, highlighting some of the best research write-ups especially crafted with the general public in mind. This includes some great examples for budding writers out there! Heather's been reading a lot about careers in science and how to get them. First up is Megan McArdle's piece in The Atlantic on the value of networking, and why it isn't really work at all. Next is a piece by Chris Mooney on what it means to be a scientist today, followed by the response from Andrew Pratt outlining the need to be more open about the number of scientists pursuing non-traditional careers (both at Science Progress). In that spirit, for those of you looking for options after you graduate or finish your commitments to your current labs, the AAAS has an upcoming webinar on nontraditional careers. (Flygal recommends this- since she knows one of the panelists!). Also, don't miss Sheril's (growing) list of fellowships in science policy over at The Intersection. Emily Norton's been pretty engrossed in her project on the health implications of climate change (look for her three part series starting on Earth Day! ), and recommends this Andrew Revkin post on a new study released showing that on the way to an overall warming trend, it is normal to have brief periods of cooling. Flygal couldn't wait to tell you about this "totally awesome" piece over at A Blog Around the Clock about communicating, reporting and science in the new media age. A tad long perhaps, but worth every word. For a (slightly) shorter look at the same topic, Ed Yong over at Not Exactly Rocket Science has posted his two cents on the debate. Happy reading and for those of you celebrating, happy festivity of your choice! Here at New Voices we encourage all forms of advocacy, including visiting with your members of Congress and their staffs. It may take a significant amount of time (and potentially travel) to advocate on Capitol Hill in Washington, DC, but the impact can be long lasting. After a visit last month, prominent U.S. global health researcher-advocates, Adnan Hyder, MD, MPH, PhD, and Mathuram Santosham, MD, MPH, shared their thoughts on their meetings with policymaker and committee offices as Paul G. Rogers Society Ambassadors for Global Health Research. We asked both of the Ambassadors what one piece of advice they would give to someone who wanted to become an advocate. "Work hard to gain credibility in the field of your choice; people must be able to trust you and your experience in science. And then use it to advocate for global health research." "Sincerity and passion for the cause are key elements of advocacy of global health research." Think about common food allergies and be sure to have at least one appropriate selection. For example, there should be an item that does not contain nuts. To plan an appropriate menu, think about the type of event you are hosting. Is it a sit-down event that would be complemented by dinner? 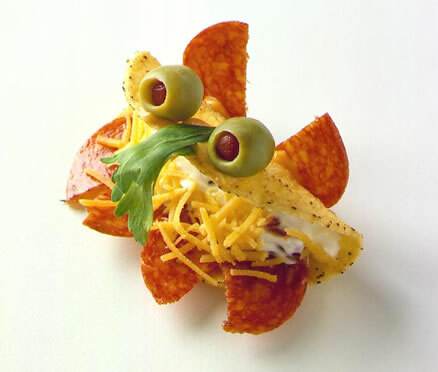 Is it a networking event where hors d' oeuvres would make more sense? Are you attracting an older more professional crowd that would be pleased with more sophisticated options? Or is it an event for students, who may be happy with cookies or cheese and crackers? If you are planning a more formal event, like a sit-down dinner, inquire about guest’s dietary restrictions when they RSVP so that you may plan in advance if someone has particular allergies, is diabetic, vegetarian, or has any other specific requests. The biggest thing to remember in planning a menu though is that the food is going to be a part of your event. Doughnuts and pastries aren't the best breakfast menu for a conference on obesity and a three course meal preceding a lecture on poverty is probably not a good plan. Keep your event theme and your guests in mind, and you should have an excellent menu for whatever you're planning. There are three specific points I want to make about this finding. Communication is about the audience, not the communicator. It's all about you. And "you" is your audience. One of the most permeating things I've learned is that communication should appeal to the person receiving it. The sure-fire way to make that happen is to make the message about them. Think about some of the marketing campaigns of the 100 most popular social brands: #39 Just do it and #57 Have it your way. I bet you don't even have to look at the list to know those brands. And in the top ten, every one of the brands represents a product line that is designed for personalization and a true customer experience - heck, two of them have "i" in the name. Sure, the company is happy you remember their name. But they want you to remember that this experience is about you - that they're working for you. And that's the feeling you want people to walk away from science communication with too. Needs and desires are not the same thing. Brussel sprouts are good for you. Gummy bears are not. I'm not going to delve into this too much because I think we can all recognize the difference between telling someone the truth and what they want to hear. But the point here is that communicators should be able to establish the difference between the needs and desires of their audience and communicate to fulfill both. If you can easily read above an 8th grade reading level, chances are your needs and desires are different than those of the general public. Scientists are different from the general public in more than just educational background. There is a culture, a methodology; science is just a different world. That world intersects with the "real world" everywhere and in lots of ways (which is what we hope you're communicating). Like traveling, even if you come from one place, you need to respect the cultures and habits of another. It's more than just simplifying your vocabulary - it's knowing what's important and why it matters. I know it sometimes seems inconceivable that people don't want all the details, don't want to pursue the question further, or won't go in search of more information. 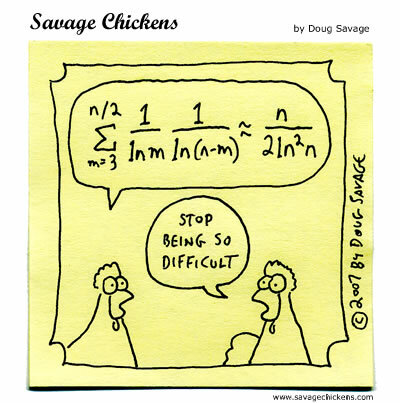 But then again, isn't any number being put to the zero power equaling one a little strange too? I guess it just depends on your perspective. For more on communicating to your audience, check out Your Attention, Please. a book on "how to appeal to today's distracted, disinterested, disengaged, disenchanted, and busy audiences" by Paul Brown and Alison Davis. It's a very quick read, broken up into short, digestible chapters. *I have no proof of this. Part 1 - Audiences for science communication (here and here). Part 2 - Understanding versus appreciation of science. Almost every idea I had was vetoed. Why? It has to do with science communication - incidentally- one of the raison d'etres of this blog. Well- I, like most scientists, thought that the problem with science communication is that people just don't get science. So, if we did a better job explaining things- everyone would understand why science is important and the money will flow and all will be well. that the public has a deficit in scientific knowledge. So if scientists just work hard to remedy that deficit by giving people more information, more details about their research - all will be well. That made sense to me. After all when I am interested in something - anything from campaign manifestos to the merits of the slow food movement- I try and get my hands on as much information as I can about the subject, weigh the evidence and then try to reach my own conclusions. But, the reality is that I'm an outlier and most folks aren't interested enough to spend time acquiring information, sifting through the evidence and then reaching a conclusion. Instead, people generally care about something that affects them directly and want to know what they should do about it. They don't really care what the exact chemical contaminants are in city water. All they want to know is whether it is safe for their kids to drink water from the faucet. This was a revelation to me. I had always assumed that more information is better - it always is in the science world. I never thought it could be otherwise. I wanted to move from the bench to policy partly because I felt there was a need for scientists to better communicate with the public. I thought that most of it was easily solved by using simple, jargon-free terms to EXPLAIN the science and demystify the details of the research. But we won't really get going until we follow it up with other steps in the same direction. With Easter recess approaching, many members of Congress will be back in their districts and hoping to hear from constituents like you! Below is a list of members having one or more meetings in April. Check out their website(s) for details. If you don't see your member on the list, we may just not know about it, so contact the national or local office to find out. While you're stuck inside on this rainy day in Washington, do some online advocacy! Two great advocacy opportunities with deadlines of today and tomorrow! A bipartisan group of Representatives are inviting their congressional colleagues to join them on a letter supporting increased funding for NIH in FY 2010. Please support these champions who are calling for a strong increase in NIH funding by writing to your Representative immediately. The deadline for Members to sign the letter is April 2. President Obama started the FY 2010 funding process when he issued an outline of his budget at the end of February. Now the budget is in the hands of Congress, and it's time for research advocates to begin speaking out. Each congressional office can submit Program Level Requests to the Labor, Health and Human Services Appropriations Subcommittee to recommend an increase for the NIH in FY 2010. Please contact your Representative now to urge him or her to request an increase in NIH funding of at least 10% in FY 2010. The deadline to submit Program Level Requests to the Subcommittee is April 3. Last week I wrote about research going on at the National Arboretum and asked if anyone knew more about it. Turns out, someone did. Dr. Margaret Pooler studies flowering cherry trees at the National Arboretum. 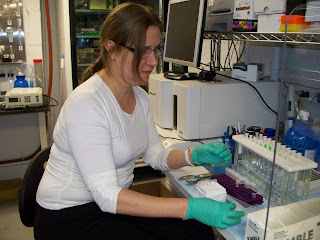 She works on the genetics, breeding and evaluation of species. She is also involved in generating newer varieties of cherry trees - trees that are cold resistant, produce bigger blooms, are disease resistant etc. Research like hers has biological, environmental, and even diplomatic implications. "Society will benefit from this research in several ways. By selecting for disease and pest tolerance, these new varieties will hopefully require less input of pesticides in production and in the landscape. The use of underutilized species in our crosses will broaden the diversity of flowering cherries in the landscape and allow more choices in terms of plant size, habit, flowering time, etc. Plus it is hard to measure but easy to see (based on visits this week to the Tidal Basin) the effect that cherry blossoms in spring have on society." I couldn't agree with her more. But, how could this research possibly help us diplomatically? The 2,000 trees that originally arrived were found to be infected with insects and were deemed unfit for planting by the US Agriculture department. President Taft gave his consent for the trees to be burned. A potential diplomatic kerfluffle was avoided by letters from the Secretary of State to the Japanese ambassador. A new batch of 3,020 trees was specially bred and shipped to Washington. This group was not only healthy, but included 12 different varieties of cherry trees. For more information about societal impacts and the history of the tidal basin cherry trees, check out this timeline from the National Park Service . And for those in the DC area interested in the biological aspects, Dr. Pooler will be giving a lecture/demonstration of how the arboretum's programs are creating new and improved varieties of flowering cherry trees on Sunday, April 5. *The National Cherry Blossom festival features (in addition to the gorgeous blooms) a parade, a kite festival, a lantern lighting ceremony, sushi and sake tasting and much more. Since 1994, the festival has chosen over 50 young people to serve as goodwill ambassadors. They act as cultural liasons for the festival while promoting friendship between the United States and Japan.